Rental Costume includes: This is the classic formal Chauffeur's uniform. It is used for period pieces as well as for limo drivers for contemporary weddings and other functions. The uniform consists of an English cut coat with jodhpurs (trousers) and a chauffeurs cap and boot tops. (Note: This rental does not include the gloves shown in the photo.). Rental Costume includes: This is a fine example of a ladies day dress which would be worn to work, church, shopping or social events. 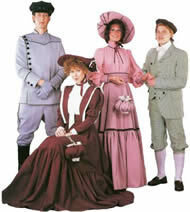 It is made of a poly-gabardine dress with full sleeves and a ruffled bottom; it has a simulated light satin pleated blouse and includes a complementing hat. Rental Costume includes: This costume consists of a skirt with ruffles at the bottom: a bodice and bishop type sleeve in matching colors, a belt and complementing hat. It is trimmed with velvet or other fabrics. (Note: The handbag shown in the photo is not included in the rental of this costume.). Rental Costume includes: The famous 'belted' suit of the late 19th century and early 20th century. It has a fully belted jacket with matching vest and either knickers or trousers. It is made from a tweed fabric. It also includes a complementing 'mini apple' hat, shirt, stockings and bow tie.